Is Meryl Streep's character really based on Vogue editor-in-chief Anna Wintour? Many people have speculated that Meryl Streep's Miranda Priestly character is in fact based on Vogue's editor-in-chief Anna Wintour. This logical true story connection undoubtedly helped to sell more novels and movie tickets, not to mention bring Anna Wintour to the attention of the masses. Lauren Weisberger, the author of The Devil Wears Prada book, has never publicly admitted that she based Meryl Streep's character on Anna Wintour, despite their obvious similarities -Salon.com. Did Prada author Lauren Weisberger once work as the Assistant to the Editor-in-Chief of Vogue, Anna Wintour? 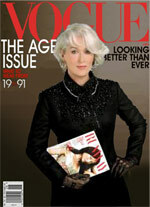 In what ways is the book's Miranda Priestly similar to Vogue's Anna Wintour? Both Miranda from the book and the real life Anna Wintour are British. Both serve as the editor-in-chief of a major fashion magazine. Both worked at their magazine's overseas counterpart before being transferred to New York (Miranda at French Runway and Wintour at British Vogue). Both have a fashion quirk (Wintour wears large, dark sunglasses while in the book Miranda sports a white Hermès scarf). Both serve on the board of the Metropolitan Museum of Art. Both have marital problems that end in divorce. Both are known for their cold, cutthroat personalities. Both have nearly identical offices (which prompted Wintour to redecorate hers). Did Wintour really attend the movie's premiere? Yes. Vogue Editor-in-Chief Anna Wintour wore a Prada dress to a special advance screening of The Devil Wears Prada in New York. Meryl Streep described her as being "very, very cordial" when the two were introduced at the movie's premiere. "We chatted, briefly," said Streep. "She was very gracious. I think the book was probably more upsetting to her than the film." What did Anna Wintour think of the movie? The day after she attended the premiere of The Devil Wears Prada, Anna Wintour's spokesman issued a statement about the film, "She thought it was very entertaining. It was satire. What's not to like?" (guardian.co.uk) In a Barbara Walters Anna Wintour interview, the Vogue editor-in-chief conveyed her reaction to the movie by saying, "I thought the film was really entertaining. Anything that makes fashion entertaining and glamorous and interesting is wonderful for our industry. So, I was 100 percent behind it" (ABC News). Did Anna Wintour recognize any part of herself in Meryl Streep's character? Wintour told Barbara Walters that she appreciated Streep's portrayal of the "decisive" editor, "I'm a very decisive person. I think it's actually helpful to people that you are working with, that you can make decisions," she said. "So, if Meryl seemed somewhat strong, I respect that" (ABC News). One leading UK fashion editor referred to the book and movie's Miranda Priestly Anna Wintour connection as a "poor imitation of life," stating that any type of fiction could surely not surpass the reality of Wintour. The editor cited Wintour's outrageous requests at fashion shows to be seated out of the view of specific rival editors, and the fact that she does not carry a handbag. Instead, she utilizes the services of two Vogue staff members, whose main job is to carry her things around for her (guardian.co.uk). Does Vogue magazine's Anna Wintour expect her employees to come to work in style? The Anna Wintour Devil Wears Prada true story reveals that, like Runway magazine's Miranda Priestly in the movie, the real life Anna Wintour expects her employees to dress up to the nines. In the BBC documentary Boss Woman, Vogue executive Plum Sykes explains, "Anna would never specify how you need to look; but I know that if I went into her office I would need to wear high heels and look groomed and look 'fashion'. The clothes that people wear here in the day are clothes that most people would wear on their most glamorous night out of the year. Who's going to wear a chiffon Dolce & Gabbana skirt like this to the office? Only someone who works at Vogue" (The Independent). Anna Wintour herself has stated, "Hopefully [our employees] come to Vogue because they love fashion, and we expect, we don't dictate, a certain style of dress" (ABC News). 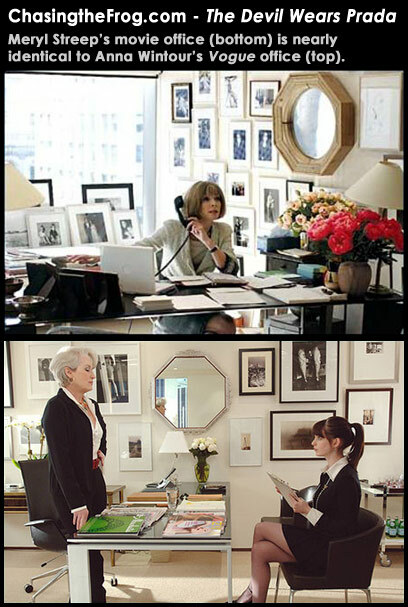 Is Miranda Priestly's office a replica of Anna Wintour's? Wintour's Vogue office (left). Click image to enlarge. Is the real Anna Wintour as cruel as Miranda Priestly? Did a former employee of Anna Wintour really criticize Weisberger for claiming that her book was not based on her time at Vogue? Yes. Former Anna Wintour employee Kate Betts stated in the April 13, 2003 New York Times Book Review that Weisberger and Wintour are the direct counterparts of their fictional characters. She criticized Weisberger's main character by declaring, "Andrea has an unbecoming superiority complex and is just as much a snob as the snobs she is thrown in with." She went on to write, "[Andrea] makes no bones about the fashion business being beneath her, or that her true calling is not to be fetching tall lattes for Anna/Miranda but to be supplying high-minded prose for The New Yorker." She summed up the book by calling it "bite-the-boss fiction." After working at Vogue for Anna Wintour, Kate Betts held the title of editor-in-chief at rival fashion magazine Harper's Bazaar. Does author Lauren Weisberger believe that she would have gotten published if she hadn't spent a year as Anna Wintour's assistant? Did Lauren really start writing The Devil Wears Prada book as nonfiction? Why won't author Lauren Weisberger admit that The Devil Wears Prada novel is based on Vogue and Anna Wintour? Author Lauren Weisberger has been poked and prodded by interviewers who are eager to confirm what so many readers suspect, that the real Miranda Priestly is actually Vogue Editor-in-Chief Anna Wintour. Lauren usually fends off prying gossip hounds with some type of generalized response. "The book is a compilation of so many people's crazy stories," Lauren offered during a Canada.com interview. "My friends all worked for insane people in stints in every industry." Elsewhere she has stated, "It doesn't so closely resemble my own experiences, only in that, yes, one of my jobs out of college was working at a magazine. To a certain extent, you do write what you know" (Salon.com). During an author Q&A, Lauren told Random House, "A lot of the anecdotes and demands and craziness are products of my imagination, stories I created at four in the morning while chugging coffee and fighting sleep deprivation. But there's reality there, too. ...I imagine that assistants everywhere will recognize some of their own experiences in Andrea's life." Another obvious reason why Weisberger might not want to confirm the Anna Wintour Devil Wears Prada true story is because Weisberger does not paint a very flattering Miranda in her book. Wintour might see this as an attack on her character, which could lead to a lawsuit. Thus, the novel has been dubbed a roman à clef, a novel describing real life, behind a façade of fiction. Was author Lauren Weisberger really as fashion illiterate as Anne Hathaway's character in the movie? Did Lauren graduate from Northwestern like Andrea Sachs in the movie? No. Unlike Andrea Sachs (Anne Hathaway) from The Devil Wears Prada movie, author Lauren Weisberger graduated from Cornell University in 1999 with a BA in English (LaurenWeisberger.com). While at Cornell, she was a member of the Alpha Epsilon Phi sorority (aephi.org). How did author Lauren Weisberger land a job at Vogue? she did not fit in. Did Lauren find it hard to fit in at Vogue, similar to Anne Hathaway's character in the movie? At age twenty-three, was Lauren Weisberger as well traveled as her Devil Wears Prada character Andrea Sachs? Yes. In the book The Devil Wears Prada, the main character, Andrea Sachs, had visited India, Thailand and Italy, in addition to studying abroad in the United Kingdom and Canada. Similarly, The Devil Wears Prada true story tells us that after college author Lauren Weisberger traveled as a backpacker through Europe, Israel, Egypt, Jordan, Thailand, India, Nepal, and Hong Kong. After returning home, she moved to Manhattan. Does Lauren have a lot in common with her Devil Wears Prada character Andrea Sachs? "I see a lot of myself in Andrea," Lauren admits, "from her love of writing to her tendency to get so wrapped up in things that she somehow finds it difficult to see the big picture. It was only natural for me to have her grow up in a small town, study English at university, and move to New York after graduation, because that's clearly a familiar path for me. But I think she's a hell of a lot stronger than I could ever be. ... And while, like Andrea, I care very little about high fashion, I of course wouldn't turn down an afternoon of shopping with my friends. I definitely like clothes as much as the next girl, just not to the extent of people who work in the fashion industry" (RandomHouse.com). Both Lauren and her fictional character also share the same religious upbringing. They were both raised in Jewish households. Did Lauren herself aspire to one day write for The New Yorker? Did Anna Wintour ever demand an assistant to get her a copy of an unpublished Harry Potter manuscript? Did Lauren get to wear really cool clothes while working at Vogue? Yes. In the movie, Andrea Sachs (Anne Hathaway) gets to wear some of the designer clothes that are available at the fictional Runway magazine. Exploring The Devil Wears Prada true story reveals that Lauren Weisberger also got to wear really cool stuff while working at Vogue. "It wasn't a total free-for-all," Lauren says, "but I would say the biggest benefit wouldn't necessarily have been the clothes, or the make-up, all of which was fun! But my personal favorite was the jewelry, there was an entire accessories department and you could borrow things for events and bring them back. The accessories closet was enormous and included all of the jewelry, bags, scarves, the belts - it was just floor to ceiling, which was fun!" (Canada.com) The Runway mockup on the left is provided courtesy of the fashion blog Miss at la Playa, where other similar Runway magazine mockups can be viewed. Was Lauren Weisberger pleased with the movie version of her book? Have any other movie characters been modeled after Anna Wintour? based on Wintour's look (top). It has also been suggested that the character of Edna Mode in Pixar's 2004 animated film The Incredibles is based on her. In the movie, the character advises style-conscious superheroes against the wisdom of wearing capes. Despite their similar hairstyles, when asked about The Incredibles character, Wintour responded by saying, "I didn't see it. Sorry." (guardian.co.uk) Brad Bird, the director of The Incredibles, stated in an interview that the Edna Mode character was based on a variety of different people, including (but not limited to) costume designer Edith Head, author Patricia Highsmith and actress Linda Hunt. Did author Lauren Weisberger have a cameo in The Devil Wears Prada movie? Is it true that top fashion designers were afraid to appear in the movie? The true story behind The Devil Wears Prada reveals that only one designer, Valentino Garavani, actually appeared as himself in the movie (ReelzChannel). It has been reported that Vogue's Anna Wintour warned major fashion designers to not accept their invitations to make cameo appearances. Yet, no hard evidence of such warnings can be verified. However, the absence of these individuals in the movie may be sufficient evidence in itself. Has Weisberger written any other stories that are closely related to experiences from her life? Yes. Published in 2005, Lauren's second novel, Everyone Worth Knowing, tells the story of an unglamorous young single woman, who gets caught up in New York City's party circuit as a result of being thrust into a glamorous public relations job. Similar to Prada, the main character must choose between the environment that is corrupting her and the relationships with family and friends that are slowly dissolving because of it. Lauren's collection of short stories published in American Girls About Town draws heavily from experiences in her own life. This is specifically true of her short story "The Bamboo Confessions," which explores the physical and emotional journey of a New York City backpacker, who travels around the world and begins to view her love life back home in a different light. After college, Lauren herself traveled as a backpacker through Europe, Israel, Egypt, Jordan, Thailand, India, Nepal, and Hong Kong. Does Lauren care that critics call her books "chick lit"? No. "I don't know why writing literature is seen as a loftier goal than writing books that people really can read on a beach or a plane," Lauren said. "I love trying to write about the different things I'm actually going through and that my friends are going through." Meet the real life inspirations behind The Devil Wears Prada movie. First, Vogue magazine Editor-in-Chief Anna Wintour reacts to the movie and Meryl Streep's portrayal of her counterpart Miranda Priestly. Then, watch author Lauren Weisberger admit to actually being a huge fan of the movie version of her book, a rarity for most authors.